Britain's top finance official: "It will not be plain sailing"
The vote to leave the European Union will damage the U.K. economy and government finances, the country's Treasury chief said Monday. 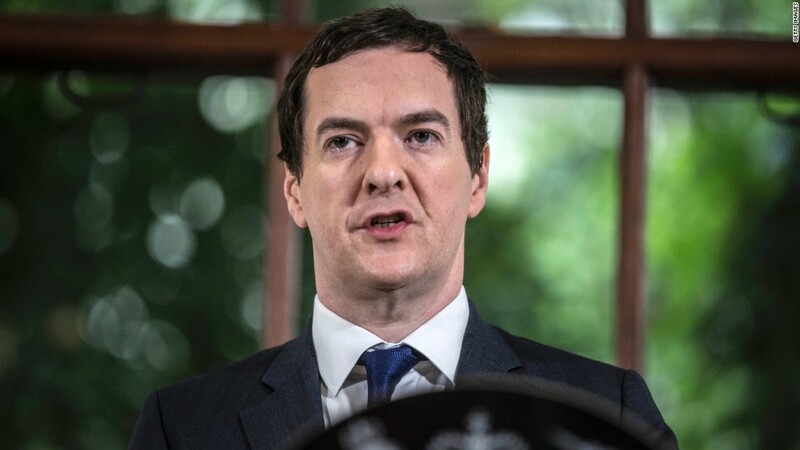 Chancellor of the Exchequer George Osborne, speaking publicly for the first time since Thursday's historic referendum, said Britain has a strong economy and robust contingency plans to deal with the financial fallout, but it would not be "plain sailing" in the days ahead. "It is already evident that as a result of Thursday's decision some firms are pausing their decisions to invest and hire people," Osborne told reporters. "This will have an impact on the economy and public finances." Before Thursday's vote, Osborne warned that Brexit could blow a $43 billion hole in government finances, requiring an emergency budget to set out tax increases or spending cuts. Speaking Monday, he said the response to weaker growth and government revenues would have to wait at least three months until a new prime minister had been elected. David Cameron, who had campaigned for the U.K. to remain a member of the European Union, resigned as prime minister on Friday but said he would remain in office as a caretaker leader of the government until his successor can be chosen in October. "I'm saying there will have to be action to deal with the impact on public finances, but that will have to wait for the new prime minister," Osborne said. Osborne ducked questions about whether he would resign, saying only that he would address speculation about the future of the Conservative Party in "the coming days."